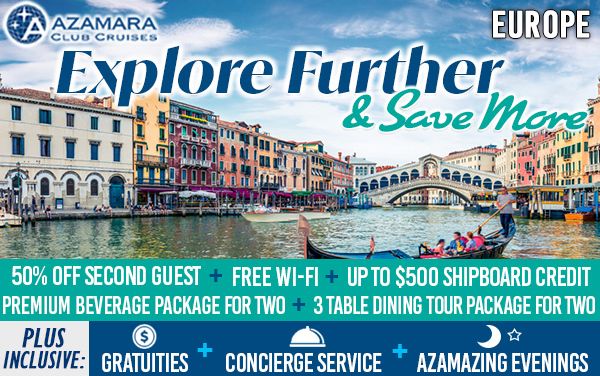 Azamara Cruise Deals | CruCon® Cruise Outlet - Every Cruise On Sale Every Day! Minimum Cabin Cost applies for all CruCon booking perks. If giving any perk violates the maximum allowable value-add requirement as directed by the cruise lines, substitute perk will be given up to maximum allowable value. Shipboard Credit based on double occupancy. All rates are per person, based on double occupancy, cruise only, in USD, and subject to availability. Rates may vary by ship, departure date, and stateroom category. 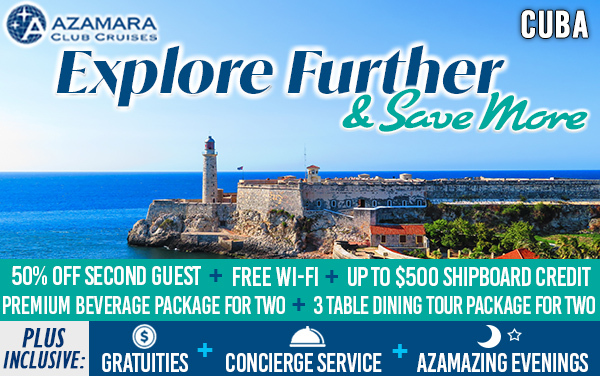 All rates, savings, offers and itineraries are subject to change without notice. Savings and offers may be withdrawn at any time. 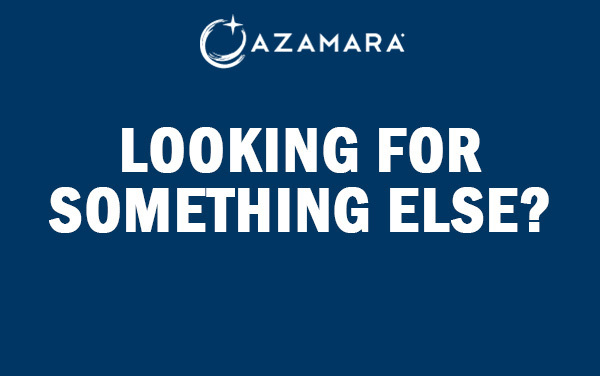 Azamara reserves the right to correct any errors, inaccuracies or omissions and to change or update fares, fees and surcharges at any time without prior notice. Free Double Upgrades applies to new bookings only. 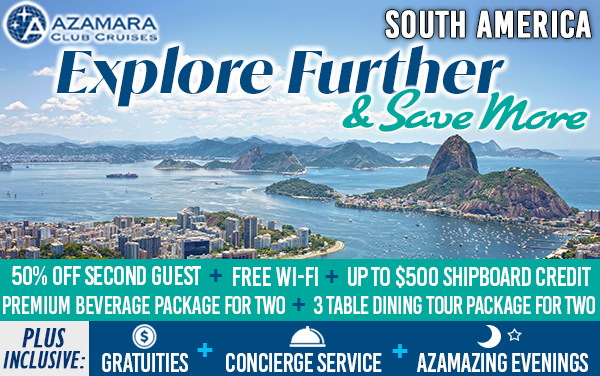 Free Double Upgrades applies to select sailings departing on or after March 1, 2019, and allows guests to receive a Club Veranda stateroom for the price of a Club Interior. All other charges, including, but not limited to, cruise taxes, fees, and port expenses, are additional and apply to all guests. Offer applies to new, individual bookings and non-contracted group bookings named and fully deposited during the Offer Period. Offer is not applicable to incentive or contracted groups. Offer is combinable with Back to Back Benefits, onboard booking savings and Le Club Voyage Quarterly Savings and one other OBC or value add. Unless stated otherwise, Offer is not combinable with any other offer or promotion, including, but not limited to, BPS Guarantee, Closed User Rates, Employee Rates, Interline Rates, Travel Agent Rates, and Net Rates. 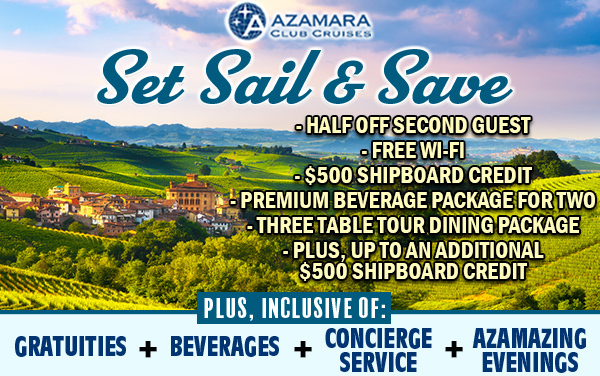 Offer does not apply to Club Veranda Plus staterooms. After the Offer Period, the Offer will be removed from the booking if the guest cancels and reinstates the booking, applies a fare change, or changes the ship or sail date of the booking; certain other changes to the booking may also result in removal of the Offer. Any referenced onboard credit mentioned throughout the online booking process is factored into the above mentioned offer and is not in addition to the offer listed above. Offer is subject to availability and change without notice and may be withdrawn at any time. This offer is applicable to U.S. and Canada residents only. Share & Save (BOGOHO): Offer applies to select sailings departing on or after April 6, 2019. BOGOHO provides 50% off cruise fare of the second guest booked in the same stateroom as the first full fare paying guest. All other charges, including, but not limited to, cruise taxes, fees, and port expenses, are additional and apply to all guests. 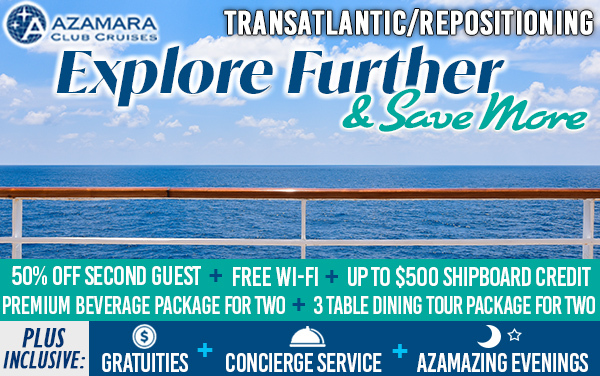 Offer applies to all stateroom categories; category availability varies by sailing. Offer may not be available on all categories on all sailings. BOGOHO+: Offer provides one Unlimited Internet package for guest booked in an oceanview or higher stateroom under BOGOHO offer. Unlimited Internet package provides guest with unlimited internet minutes for use onboard; one device per package. Offer is combinable with Back to Back Benefits, onboard booking savings and Le Club Voyage Quarterly Savings and one other OBC or value add. Unless stated otherwise, offer is not combinable with any other offer or promotion, including, but not limited to, BPS Guarantee, Closed User Rates, Employee Rates, Interline Rates, and Net Rates. 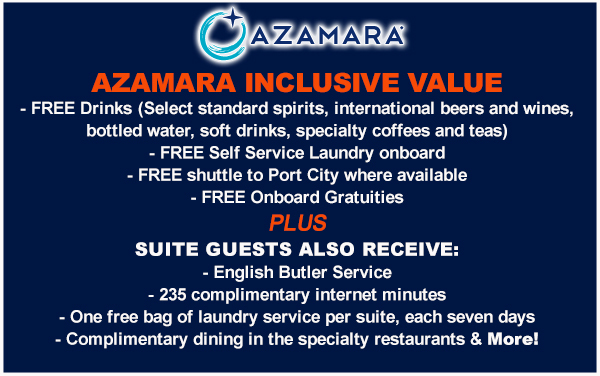 Offer is not applicable to 3rd and 4th guests in a stateroom. Offer is subject to availability and change without notice and may be withdrawn at any time. This offer is applicable to U.S. and Canada residents only. desired sailing. When booking online, you will receive a confirmation of your reservation within 10 minutes of completing the booking process. You will also receive a separate email from one of our customer service representatives on the next business day, detailing all your booking perks as these are manually added to your reservation. You can call our Customer Service Dept. at 800-493-6609 with your booking number and they can confirm your perks as well as answer any questions that you may have. If anything is not to your satisfaction at that time, you may cancel your online reservation without penalty within 24 hours as long as it is before the cruise line's penalties begin. 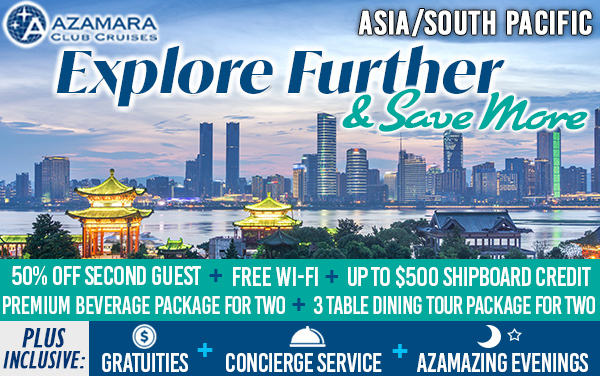 this promotion is NON-REFUNDABLE by Azamara. w/ WiFi, $500 Credit, Dining Pkg. & Drink Pkg. w/ WiFi, $800 Credit, Dining Pkg. & Drink Pkg. 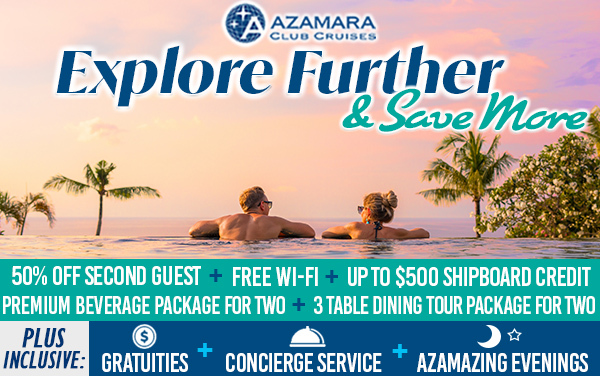 Additional Up to $500 Shipboard Credit perk not combinable with any other savings or onboard credit offer including but not limited to Le Club Voyage Savings, Onboard Booking Onboard Credit or any other OBC, value add or savings. NOTE: Taxes, fees, and port expenses are an additional $ 413 pp. NOTE: Taxes, fees, and port expenses are an additional $ 212 pp. NOTE: Taxes, fees, and port expenses are an additional $ 183 pp. NOTE: Taxes, fees, and port expenses are an additional $ 93 pp. NOTE: Taxes, fees, and port expenses are an additional $ 148 pp. NOTE: Taxes, fees, and port expenses are an additional $ 154 pp. NOTE: Taxes, fees, and port expenses are an additional $ 111 pp. NOTE: Taxes, fees, and port expenses are an additional $ 129 pp. NOTE: Taxes, fees, and port expenses are an additional $ 122 pp. NOTE: Taxes, fees, and port expenses are an additional $ 437 pp. NOTE: Taxes, fees, and port expenses are an additional $ 179 pp. NOTE: Taxes, fees, and port expenses are an additional $ 463 pp. NOTE: Taxes, fees, and port expenses are an additional $ 172 pp. w/ WiFi, $300 Credit, Dining Pkg. & Drink Pkg. NOTE: Taxes, fees, and port expenses are an additional $ 162 pp. NOTE: Taxes, fees, and port expenses are an additional $ 263 pp. NOTE: Taxes, fees, and port expenses are an additional $ 272 pp. NOTE: Taxes, fees, and port expenses are an additional $ 201 pp. NOTE: Taxes, fees, and port expenses are an additional $ 135 pp. NOTE: Taxes, fees, and port expenses are an additional $ 444 pp. NOTE: Taxes, fees, and port expenses are an additional $ 406 pp. NOTE: Taxes, fees, and port expenses are an additional $ 378 pp. NOTE: Taxes, fees, and port expenses are an additional $ 434 pp. Note: Taxes, fees, and port expenses are an additional $ 177 pp. NOTE: Taxes, fees, and port expenses are an additional $ 158 pp. NOTE: Taxes, fees, and port expenses are an additional $ 312 pp. NOTE: Taxes, fees, and port expenses are an additional $ 462 pp. NOTE: Taxes, fees, and port expenses are an additional $ 371 pp. NOTE: Taxes, fees, and port expenses are an additional $ 460 pp.